Obscene Extreme Festival 2016 will take place in Trutnov, Czech Republic on July 13-17, 2016. Sodom, Incantation and Vader are among the bands that will perform at Obscene Extreme Festival 2016. NY Deathfest 2014 will take place at St Vitus Bar – 1120 Manhattan Ave, Brooklyn Ny, on July 26-27, 2014. Defeated Sanity, Mortician and Devourment are among the bands that will perform at the NY Deathfest 2014 festival. 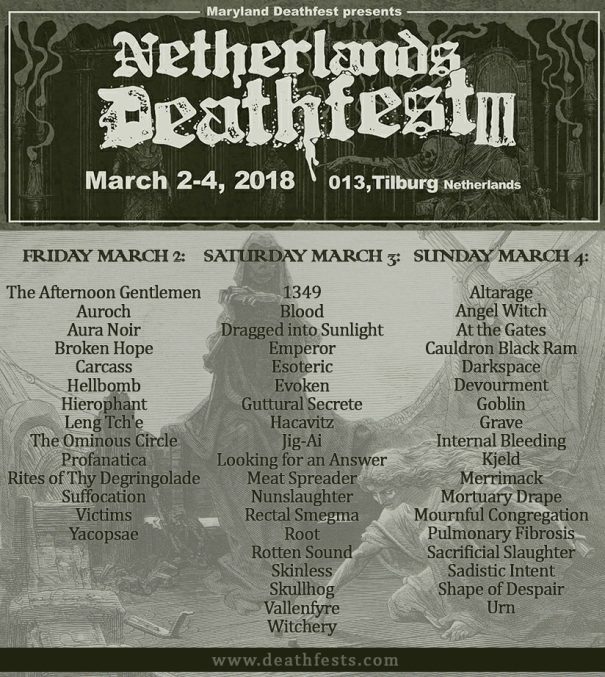 Death Feast Open Air will be held in Hünxe, Germany on June 23-25, 2011. Pestilence, Vader and Krisiun are among the bands that will perform at the Death Feast Open Air 2011 festival. Mayhem, Rotting Christ and Orphaned Land are among the bands that will perform at the Metal Mean festival held at Sur Odemont 1, 5372 Mean, Belgium on August 21, 2010. Suffocation, Aura Noir and Watain are among the bands that will perform at the Party.San Open Air held in Bad Berka, Germany on August 12-14, 2010.